What a great day for the marathon. I woke up so excited … my first Boston marathon in almost 15 years. I grew up going to the Marathon with my Dad, who was an employee for the MBTA. It was my yearly ritual as a kid. It was always around my birthday, and it was such a treat to go work with my Dad every year and watch the Marathon. This year is the first year in over a decade I am living back in Boston. The year I am a visiting professor at Boston University. The year I am living on Beacon Street in Brookline, between mile 24 and 25 of the Boston Marathon. 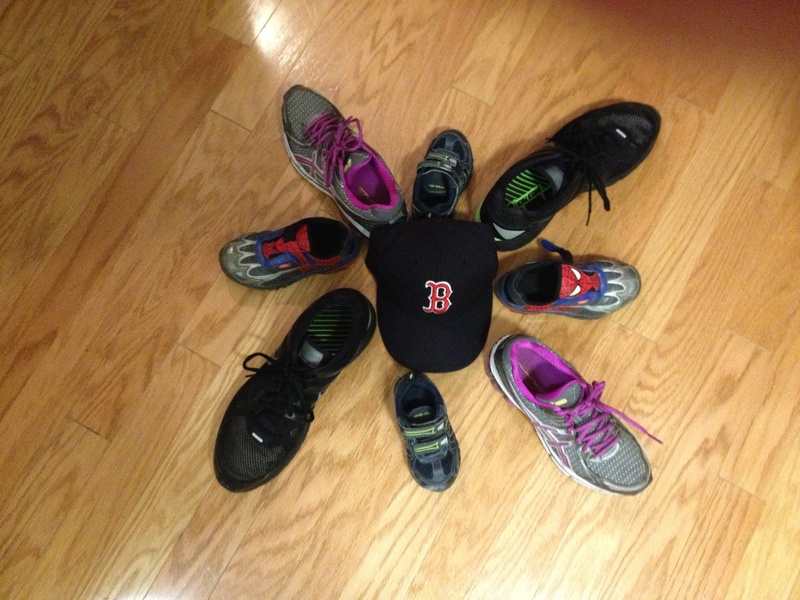 The year to take my two young sons (5 and 2) to their first Boston Marathon. The year to show them the excitement, the joy, the innocence, the spirit of the Boston marathon. The spirit of being a Bostonian. Around 11:30 we ventured to the apartment building’s blanket on Beacon St.. Neighbors had marked our spot hours before the event started. As the long awaited sun shined on our faces, we sat their eagerly awaiting the gifted and speedy wheelchair racers. We screamed fervently as they whizzed by. About fifteen minutes after, we cheered once again. This time we cheered for some of the fastest women runners in the world—their bodies danced toward their last mile with such grace. Then the men … their speediness was amazing—their bodies were gliding down through the 60 degree air with confidence. A few hours later the excitement began again. This time, I ventured down to mile 24 1/2 with my oldest son, Ryder. I explained to him that we would see our friends running, and most of the other Marathon runners. It was almost 2:15, and Beacon Street had even more passion to it … more runners … swarms of runners bouncing on the pavement. Swarms of cheerleaders on the sidelines (some more intoxicated then others). Many runners had their bodies painted with their names, or inspiration statements, such as “Today is my 50th,” or “Running for Mom.” I explained to my curious son that the Marathon is a major milestone, and some runners get dressed up, wear wigs, costumes and body paint! He was so thrilled to be there … he repeated over and over how he wanted to run next year. I explained that he had to be a bit older to run in the Marathon, even though he told me otherwise. Around 2:30, we saw some of our friends run by! Through my 36 year old eyes it was so exciting and inspirational to see friends, and even strangers run. Through my son’s 5 year old eyes, he was amazed and filled with energy and excitement of witnessing his first Marathon! He told me we would run the marathon together someday. Throughout the day my goal of running the marathon by age 40 was reconfirmed over and over again … it was especially then reconfirmed feeling the passion through the eyes of a 5-year-old. That week, the week of uneasiness, of surreal-ness, the week of thinking “did this really happen?” was like walking in a fog. Not only at home, but also at work, the expression on youths’ faces was missing innocence. At Boston University, the students were personally affected … these students are still so young in the realm of life. Many of them remember 911, but only as a young child, and may have been sheltered from the media. This was not the case now, here, in Boston, in 2013, as young adults. The week was tough. As a Bostonian attending her first Marathon as an adult, it was tough. As a Mother seeing the energy shift through the eyes of a 5-year-old, it was tough. As a professor teaching students who lost a member of the student body due to a terrorist attack occurring one mile from their campus, it was tough. The week was tough for me, but not anywhere as tough as for the families of the deceased, the amputated, and the injured.